The end of the calendar year is a great opportunity to reflect on your wins and losses from the past 12 months and put a plan in place for the next year. The keyboards are still clicking in your office, but they are searching for last minute Christmas gifts, not prospects. People still check their email, but do so from their mobile phones so your subject line needs to be on point! The Marketing team probably controls your company’s holiday email. Holiday cheer aside, why not send out a holiday email with the sole purpose of getting as many out of office replies as possible? Having thick skin, dedication to a process, curiosity, and an experimental mindset are some of the qualities we observe in the highest performing sales developers and pipeline generators. Use my three assumptions, or better yet, come up with your own and create a few experiments to turn these potential business killers into new opportunities. Assumption: People travel or take time off to be with their families. Experiment: Continue building your prospect lists and sending cold email on your normal schedule. 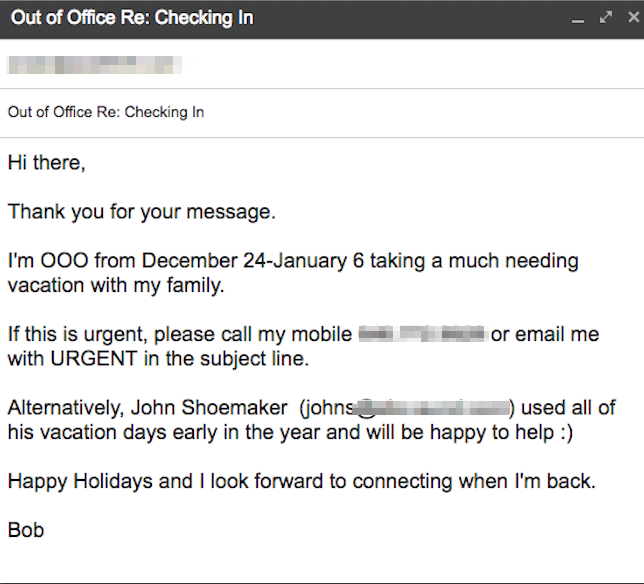 What to look for: Out of office responders can deliver a lot of useful information. The message will tell you when your prospect will be back in the office. If they are out for a while, chances are they will be putting in extra hours when they are back in the office. Make a note of this on your calendar and call them early and late. The message may tell you the best phone number to reach them (office or mobile). Update your contact records. The message may tell you who to contact as an alternative in their absence. The person(s) named as an alternative contact has the ear of your prospect. Consider reaching out to them directly if establishing communication with your target prospect doesn’t yield a desired result. The message may tell you something more personal about your prospect that can form an icebreaker for later. If you shared an experience and can relate with them personally, do so in your next communication attempt. Did you remember to send your clients a gift? Client gifts may not be on the top of your priority list, but they should be up there. That extra effort can help you close your last sale of the month, and showing clients you’re thinking of them post-sale is equally as important. Giving them a gift they’ll actually enjoy is even more important (seriously stop sending branded coffee mugs and mouse pads, no-one and I mean literally no-one wants these. Does anyone even use a real mouse anymore??). Keep top of mind with clients by providing them with something practical, whether it be just to say hello, or as a snack during a client meeting. Stand out for the nice gesture, not for the obscure one. WorkPerks, a company that provides a fun and unique custom-branded approach to client gifting, created this video which shows several client gifts that simply aren’t winners. Client gifts are important for maintaining healthy, positive client relationships. Don’t make the mistakes in this video. Be smart, gift smarter. Parting Thoughts… Even if your prospect is out of the office, presumably with family or as part of an ‘office shut down’, don’t assume that they aren’t going to take a break to sneak into the office for a half day’ to get caught up or organized. This happens most often during the week between Christmas and New Years. If you track your emails and get a notification that one of your emails was opened on a computer (not mobile), pick up the phone and call them. Bonus if you use the phone number you gleaned in their OOO message. You may be surprised to learn that the gate-keeper (ie – admin, secretary etc) is maxing out those unused and about-to-expire vacation days. 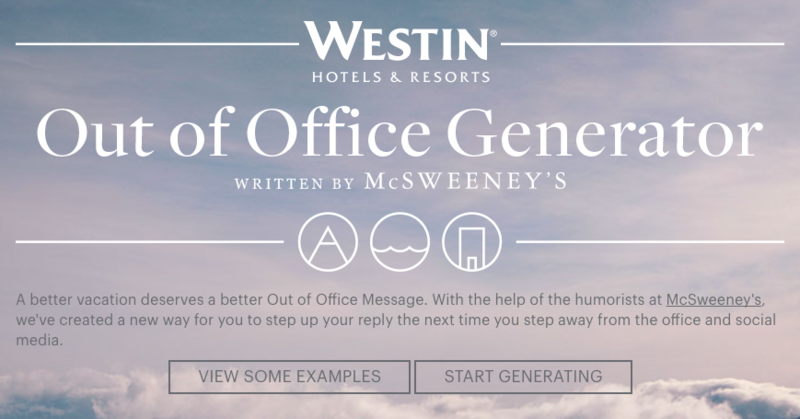 ps – If you are struggling with taking a break from your emails, try this Out Of Office generator Westin Hotels put together.